El Rinconcito is a small restaurant with a lot of character, decorated in traditional Mexican flavour. It is a family owned and operated business with the family not only preparing and serving the meals, but also providing live entertainment. Everyone working there is friendly and full of personality. A crowd favourite was their margaritas. 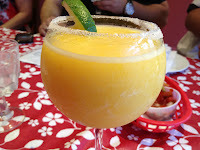 Pictured here is a mango margarita, made fresh with freshly pureed mango! You should try one. Mmmmm. On my first visit, I had a beef chimichanga. It was ok. Nothing to write home about, a lot of rice, not a lot of cheese. So, this time I went for chicken tostadas. It was also ok. The food took a long time to come, we were all grateful for the chips and salsa to hold us over. The margaritas also took a long time, but when we were leaving, we saw how the bartender made them and we understood why. My experience here was nothing special, not great, not terrible, just blah. After 2 meals there, I wouldn't go back. The only special thing about it was the margaritas and the excellent live entertainment. It's weird to feel this indifferent.